Sign O’ the Times. Prince. 1987, Warner Bros. Records. Producer: Prince. IN A NUTSHELL: A double-album masterwork of songs spanning different genres, from psychedelic to funk to slow jam to guitar pop, all played by Prince, with a little help here and there. Prince finds several characters for his voice to inhabit and plays fantastic guitar throughout. The songs may be grooving, they may be rocking, they may be sing-along cute, but they’re always fun. The man’s creativity was off the charts. I’d sing the song to myself sometimes, but I never took the time to learn all the words, I’d just sing the ones I knew. “Like walking in the rain and the snow/ When there’s nowhere to go/ And you’re feeling like a part of you is dying.” This was the bulk of my lyrical knowledge of the song, a couple lines listing just one of what I imagined were dozens of “things we do for love” throughout the song: a walk in crappy weather when you don’t feel well. I’d sometimes think, “I wonder what other miseries the song lists? Exactly what deprivations will I be signing up for eventually when I’m in love?” I thought maybe I’d gain some insight into the expectations for a person in love. But when I finally took note of the entirety of the song’s words, I was confused because the lyrics only mention one thing done for love: those lousy walks. I figured there had to be more than that. I was right. To tally up all the “things” we’ve done for love, we first must consider the word “Love.” It’s a weird one. If we use a definition that includes all romantic interest from big crushes, to first girlfriends, and even short-term girlfriends, well, then I can say I’ve embarked on a self-improvement plan, carried books through school hallways, and unwittingly driven an ex and her new boyfriend home from the airport. But were they really done for “love?” Actually, they were done to interest a girl who didn’t know me; to try to get a girl to make out with me; and to try to rekindle a doomed romance. The definition for “love” can be really broad, so let’s limit it to a form of “love” that will likely stand up to all linguistic scrutiny: long-term commitment. It’s January, 2018, and I’ve now been together with my life partner, J., for almost 25 years. Technically she’s my wife, but that seems so legalistic. Since we started to fall in love a quarter century ago, I’ve found myself doing many things for love in addition to walks in crummy weather. I’m sure she has her list, too. Pay Off Student Loan: Soon after we got together and rented an apartment together in San Francisco, through a series of corporate-level occurrences at my day job as an analytical chemist, I came into a rather large sum of money. It wasn’t “retire at 27”-type money, but it was “wow, we could have lots of fun with this!”-type money. I started dreaming of a couple weeks on an island beach somewhere. J., however, noted that the amount of dough would pay off the rest of my student loans, with enough left over for a fancy dinner and night on the town. I paid off my student loan. It seemed lame at the time, but I now (grudgingly) realize it put us in a better financial position in the long run. While we’re on the topic of teen-agers, now would be a good time to mention this one. Become a Parent: It’s not that I didn’t want to have kids, it’s more that I never really thought one way or the other about it. However, after a few years of surface-level discussion, J. told me that her “eggs are getting old,” and so it was time for me to get on-board with the idea. Of the Things I Did For Love, this is the most important. And there’s probably no better reason to have kids than because you’re in love with someone. I’m really proud of my kids and my family – no matter what I might have said (or continue to say (or will say in the future)) during times of frustration and stress! Buy House. Work: Okay, this is a little disingenuous, as I’m sure I’d be living somewhere, and I’d definitely have a job, regardless of my Love status. But since I am generally lazy, I’d probably rent an apartment. And since I am generally lazy, I’d probably have a lower-level job, perhaps involving a Fry-O-Lator. And although I’m sure J. would love me even if I manned a Fry-O-Lator and we lived in an apartment, making those choices out of sheer laziness would never fly. So one of the Things She Does For Love is help me to not be lazy. She was working on her Master’s Thesis, and it required her to drive all over the southeast corner of San Francisco mapping open spaces. I drove her around in her 1984 Chevy Cavalier station wagon so that she could write and think easier. I needed music to accompany the task, the Cavalier had a cassette player, so I looked through our collection of cassettes – nearly all of them dubbed from albums, with hand-written labels. J. honestly didn’t care what we listened to, and since I’d heard all my stuff a bunch I decided to pick one of her tapes for the drive. She’d been fond of making fancy labels for her cassettes, and they revealed many artist names I recognized, but that I’d never listened to much: Fishbone, X4, Jungle Brothers, 808 State, Tom Waits, Stetsasonic. One cassette stated, in capital letters, “PRINE.” I thought, “Oh, that must be John Prine,” another guy I’d heard of but never listened to. On closer inspection, the label revealed tiny letters below the PRINE: “sign o the times.” It wasn’t John Prine, it was misspelled Prince, and it was a record I’d heard was great5. I mentioned it to J., and she said, “Yeah! Let’s listen to that!” I was a bit skeptical, but I pulled it out of the case – for love. Then we headed to the car to map potential gardens all over Bayview Hunter’s Point. We took several trips around that neighborhood over the course of several weeks, and my recollection is that most of the time we listened to Sign O’ the Times. And I became a big fan. After writing about 67 albums6, I have a pretty good idea of the types of records I like. And I’m the first to admit there’s not a whole hell of a lot of variety. But whatever variety there is in my entire CD collection today, believe me when I say that in 1994 there was a whole lot LESS variety. J. has been a big influence in expanding my tastes and getting me to listen to artists I otherwise wouldn’t have delved into. The truth is that even though I gravitate to the basic, guitar-drum-bass rock sound, I really do appreciate variety. And what I really love about Sign O’ the Times is that its songs and sounds are so diverse. It all sounds like Prince, but it’s Prince’s take on different styles. The first track is the title track, and it’s one of the best on the record. A serious report on the state of affairs in 1987 set to a slow groove and funky guitar7. The groove is set by an electronic kick drum and bleeps and bloops, then a synth-bass riff and snare are added but they back off by 0:30, allowing the power of the lyrics to resonate. There’s a lot of open space in this song, generating the feeling that “this ain’t a song about a cute girl in a purple hat.” In the second verse Prince starts to add some guitar figures into the mix. I love what he does on the guitar throughout the song. For such a flamboyant guitarist, he really serves the song by keeping things subtle here. After the second verse the guitar joins in the riff and the song starts to move. He keeps playing behind the bridge (1:47), too. His voice is excellent and soulful, and despite the dim view of the landscape, the song ends on a hopeful note, advising folks the best strategy in tough times is to fall in love. At about 3:45 a gentle guitar solo finishes things off. It’s a simple song, but he packs so much into it. That uplifting spirit at the end carries over into the super-upbeat, happy pop of the next song, “Play In the Sunshine.” It’s a frantic, nearly frenzied song with fun bursting through the speakers. I can’t tell if the drums and bass are programmed or played8 but either way they’re addictive to the ear. This is the first of several songs on the album in which Prince pulls the terrific trick of making the listener part of the album, for example the multi-voiced background vocals (the first chorus, at 0:53, and throughout) and raw energy to give the listener the feeling of being at a performance. There’s a shredding guitar solo about 2:36, as the fake crowd chants for him to “play.” They keep it up throughout his teasing “No!” responses until he relents at 3:44 with a … xylophone solo? Okay, I’m sure it’s a synth, but imagining Prince pounding the pipes (which I have no doubt he could play) sure is fun. It’s a raucous song about loving your enemies “’til the gorilla falls off the wall,” among other things, with a slow-jam coda. The man’s creativity is boundless. He can even work wonders with a simple dance beat, as he does next on the full-on electric funk of “Housequake.” I remember J. and me dancing in our seats to this one, drawn into the song by Prince’s insistent lyrics that we do so, and feeling like we were part of the record by his use of studio “audience” sounds. Prince uses horns a lot on this record, particularly on the dance numbers, even on this mechanized beat. He does it again on “Hot Thing,” one of many songs on the album about Prince’s love of women, let’s say. It’s got a Totally 80s sound, but does have a great sax solo about 2:38 and again around 3:20 and 4:40. He blends “real” instruments with synth sounds brilliantly, as on “It,” a cold computer stomp (again about his love of … women) with a surprisingly soulful guitar solo. The beat calls to mind The Zombies’ “Time of the Season,” and throughout the record, the studio vocal tricks give some songs a psychedelic 60s feel. It’s one of my favorite songs on the record. Its four chords, story of kids in school befriending the “weird” kid and singsong melody reminds me of a kid’s song. So it’s not surprising that Prince sang it with The Muppets. The strange snare sound and swirling background sounds add to the psychedelia. He has a gift for melody, such as in the singalong jam of frustration, “Strange Relationship,” and the nifty little “Forever In My Life,” about his love of one woman. Prince has seemingly thousands of voices inside him, and he continues his focus on the love of a single woman in a falsetto that recalls Philip Bailey, of Earth, Wind and Fire, or the old soul group The Stylistics, in the album closer “Adore.” It’s a classic slow jam, with build-ups, releases and a conclusion that sounds like falling asleep in the arms of your love. It’s a style he does well, as heard on the lovely, romantic “Slow Love,” where the horns and slow swing recall a standard sung by Sinatra or Ella. It’s not about last century’s New York witticismist, but instead about a waitress who (apparently) takes a bath with Prince – but he leaves his pants on (?). Okay, it doesn’t make sense, but it sure is a great song. I don’t know what genre song this is – which makes it perfect for this record. It’s obviously R&B, but it’s got more folk-style lyrics (and does reference Joni Mitchell9) and its chord changes seem more like jazz. At about 2:45 he uses a descending melody that he’d build into the hook of a hit song a few years later. In “Ballad,” and all over Sign O’ the Times, he shows he can use studio tricks to great effect, but just in case you wondered how much of the party he’s created is computer-generated, he also includes the horn-heavy groove of “It’s Gonna Be a Beautiful Night,” (mostly) recorded live in Paris. It’s a foot-stomping salute to fun, with an 80s-style rap from Sheila E., that plays like an homage to James Brown. This is a double-album, and the story of its origins is pretty fascinating. But I couldn’t discuss all that, or go into as much detail on all of the songs as I’d have liked. I’d have loved (not really – I’d be too embarrassed) to delve into the psycho-sexual meanings behind the freaky, groovy “If I Was Your Girlfriend.” I’d have loved to spend time on the Gospel/R&B/nearly-Metal “The Cross.” Almost every song on the record has some subtle sound, oftentimes guitar, sometimes sitar or weird synth, that makes it interesting. It’s a really terrific blend of styles and sounds. And let’s not forget about the hits, either! Speaking of Sheila E., her drums10 are all over the smash “U Got the Look,” which featured a memorable MTV video. I think it’s a great song. Yes, it’s boy-meets-girl-in-the-world-series-of-love, but Prince has shown his lyrics don’t have to make a whole lot of sense to be good and fun. The video features an intro, but the song as heard on the record starts about 1:37 with a Sheila E. flourish on the timbales. It’s a goofy, funny song with a great beat and a terrific co-vocal by Sheena Easton. There’s all kinds of guitar squawks throughout, different voices, weird sounds … I love it. And the chorus of “Your face is jammin’/ Your body’s heck-a-slammin’/ If love is good/ Let’s get to rammin'” … well, that’s just comedic genius. The guitar wails (4:44 on the video) all the way to the end. Another big hit, with wailing guitar, and also with a video all over MTV in 198711, is the rocking pop of “I Could Never Take The Place of Your Man,” in which Prince’s honesty about simply wanting a one night stand is actually a decent move. I like the drums in this song. They sound real, and Sheila E. isn’t credited, so I guess Prince plays them, along with everything else on the song. The cool little bass riff after every line. The power-chord guitar that enters at 0:40, and the harmony vocal that enters along with it. The breathy background vocals and oohs and ahhs throughout. What I really like (surprise!) is the guitar. There’s a solo that starts about 2:43 that turns into a series of frantic, repeated squeals that I love. I used to think the repetition was created using an echo, but I think he actually played each riff twice, as there are subtle sound differences each time. It then goes into a slow, quiet section of Prince’s jamming with himself on dual guitars before the riff returns to end the song. One of the most important – perhaps THE most important – effects of being in love is getting changed by love, allowing that gravitational pull between you to rearrange you and expose you so you can discover new ideas and see facets of yourself you hadn’t recognized before. Maybe it’s a naked hot spring. Maybe it’s an excellent album. Whether a relationship lasts a long time or a short time, we’re all better off for the experience. Maybe that’s what that 10CC song was supposed to mean. This entry was posted in Albums 40 - 31 and tagged 1987, Double Album, Funk, Guitar, Multi Genre, One Man Band, Prince, Sheila E., Sign O' The Times, Things We Do For Love. Bookmark the permalink. A few seconds of “I’m not in love” and I totally get late 70’s flashbacks…………WEBN radio Cincinnati. I hear you. Another pool song. Which was, sadly, devastated by wildfires in 2015! 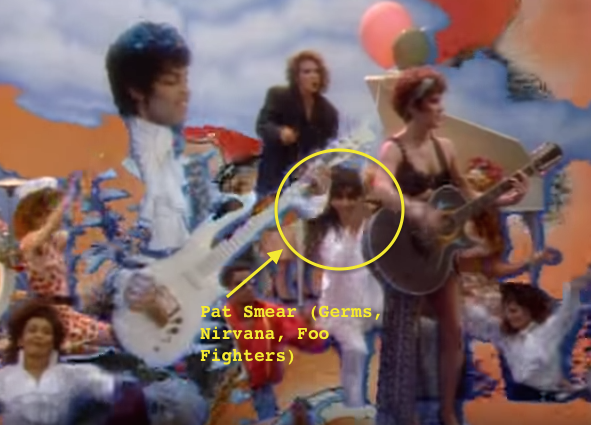 The video of which, perhaps shockingly, features Germs/Nirvana/Foo Fighters member, and punk gadfly, Pat Smear, looking like a Celestine Prophecy adherent and happily gettin’ down with the band. I worked with a guy in college in the late 80s who, although he was approaching 50, loved Prince, and he often spoke of what a masterpiece the record was. Unusual for Prince, the official video of the song stresses the lyrical content of the song. The credits list “Performed by Prince,” and he was a one-man-band, but it doesn’t list the instrumentation on each song. And my ear isn’t sufficient to tell the difference. Prince seems to have been both a folk fan and a nice guy. After his death, Suzanne Vega shared a handwritten note from him. J. saw the Prince live once, and was – unfortunately – not impressed. She said, however, that Sheila E., who drummed live for him, was awesome, and the best part of the show. Much better than Prince’s ejaculating guitar. This video isn’t the video from 1987, however. This is a live clip.